This week’s blog post is by MSU faculty member Matt Schrenk (Dept. of Geological Sciences & Dept. of Microbiology and Molecular Genetics). 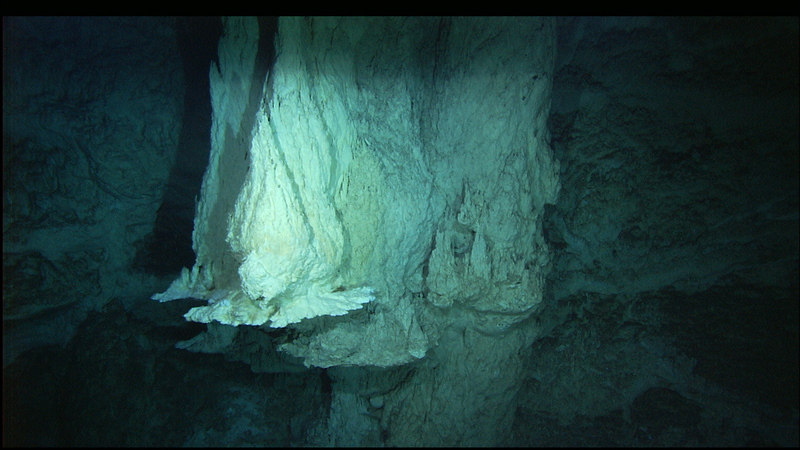 IMAX flange on the northwestern side of the 60-meter-tall Poseidon chimney at the Lost City Hydrothermal Field, venting 55°C, pH 11 fluids. Image courtesy of IFE, URI-JAO, Lost City Science Party, and NOAA. … a kilometer beneath the sea. We set sail from Southampton, UK in late October aboard the RRS James Cook on IODP Expedition 357 (X357). Our mission: to drill into the Atlantis Massif, a 5 km tall mountain along the Mid-Atlantic Ridge, and home to the Lost City hydrothermal field- a series of ethereal-looking chimney structures which many believe are an analog to where life on Earth first originated. Earlier work at Lost City found that circulating hydrothermal fluids contain energy and organic compounds, usually considered to be the product of life, originating from abiological processes deep within the Earth. Microbial communities use these compounds- primarily methane and hydrogen, to fuel their metabolism and form prolific biofilms within the chimney structures. But, on this trip, we hope to get beneath the chimney structures- to the ‘root zone’ where these primitive biochemical reactions occur, and to see what life, if any, survives there. One of the primary goals of our expedition is to identify how microorganisms in the subsurface use these compounds, and what this can tell us about the emergence and evolution of life on early Earth and perhaps other planets and moons. 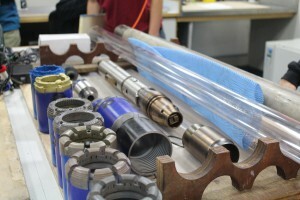 An array of diamond impregnated drill bits used on the bottom-hole assembly to drill into rocks of varying hardness at the bottom of the seafloor. Core barrel is 61 mm across. Image courtesy of Y. Morono (JAMSTEC). 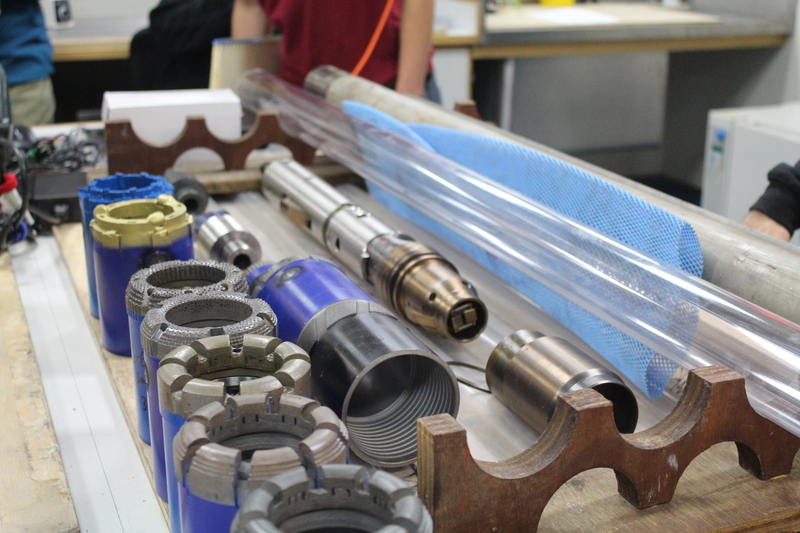 We set off on X357 as a team of microbiologists, petrologists, organic geochemists, and petrophysicists with two seabed rock drills to access the fractures and pore spaces of the sub-seafloor. During our long transit to the Lost City at 30°N and 42°W (or the middle-of-nowhere to anyone looking at a map), we went over and over and over again our procedures for sampling the rock cleanly- for keeping the carbon and organisms and DNA from ‘surface’ life from contaminating our precious samples. 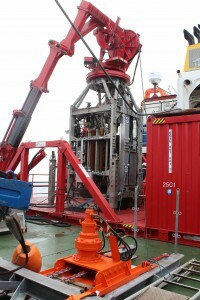 The level of detail in planning has been extraordinary, from the delivery of ultra-sensitive PFC tracers into the drilling fluids, to the attempts to track and constrain the origin of carbon (especially surface-derived ‘living’ carbon) on the ship, to taking dozens and dozens of samples from every conceivable spot- even the greases the driller’s use!- to source track microbial DNA. Perhaps the most extraordinary part of the project are the seabed rock drills themselves, which robotically bore through solid rock a kilometer beneath the sea surface, operated remotely by technicians onboard the ship. On this cruise we have two of these drills, allowing us to go continuously for almost a month, alternating between the MeBo (Marum- University of Bremen) and the RD2 (British Geological Survey). I have worked with samples from the Lost City before, having spent the better part of my doctorate squeezing DNA out of rocks, and trying unsuccessfully to domesticate the microbes found within chimney materials. As my Ph.D. advisor would probably say- the ‘holy grail’ would be if we could obtain an organism from Lost City in pure culture, to study if these organisms really are ‘living fossils’, and if their genomes and their biochemistry tells us something about the earliest biochemical pathways. I spent months prior to the cruise preparing hundreds of tubes of different growth media to cast a wide net to capture this ‘organism X’, guided by clues of what we have learned over the last decade, and hopefully some intuition. My fingers are crossed. Fortunately, in the time since my graduate work, a far more reliable approach has emerged through the high throughput sequencing of DNA. Even if our cultivation attempts are not completely successful- we can still use approaches such as shotgun metagenomics and single cell sorting and sequencing to reconstruct microbial genomes and to conduct evolutionary comparisons to other organisms and genes. Hence the comprehensive tests we are doing for contamination and context. to 50 m below the seafloor. Image courtesy of Y. Morono (JAMSTEC). The Lost City system is fascinating from an early evolution perspective. Rocks originating in the Earth’s mantle are brought to the surface by plate tectonics and react with water through a process known as serpentinization, liberating carbon from the deep Earth, and catalyzing the formation of methane and other short-chain hydrocarbons. These processes were likely even more common early in Earth’s history, before the planetary crust had completely distilled into the different materials we have today. Hydrothermal circulation moves seawater through the fractures and pore spaces of the subseafloor- across this catalytic mineral matrix, before emerging at the seabed. The circulation sets up gradients between hot, highly alkaline (pH 10+) fluids and seawater, which some have argued resemble early cell membranes and set up natural proton gradients which are a common feature of all cells on the modern Earth. Within this catalytic milieu, ‘single-species’ biofilms of methane-cycling Archaea grow tightly bound to the mineral surfaces, duplicating genes and physiologically diversifying to an unprecedented degree. At least, that is what we think we know- the new samples will undoubtedly introduce new wrinkles in the story. It will be difficult to detangle 3.8 billion years of evolutionary history by pulling on only one string. Nevertheless, it is exciting to have the chance to look at these vaults of biodiversity hidden deep within our planet and hear the stories that they might tell. As I write, the RD2 drill is making slow but steady progress with its diamond drill bit eating through meters of solid rock. First cores should be on deck within the next few days. The entire ship is poised and anxious to turn our best-laid plans into action. Hopefully, we will soon meet this proto-organism that lives beneath the seafloor.